With the bowling alley now almost complete we are ready to move on to the next phase of the NEBs project. That is the Pub area. We had done some preliminary renderings last year. 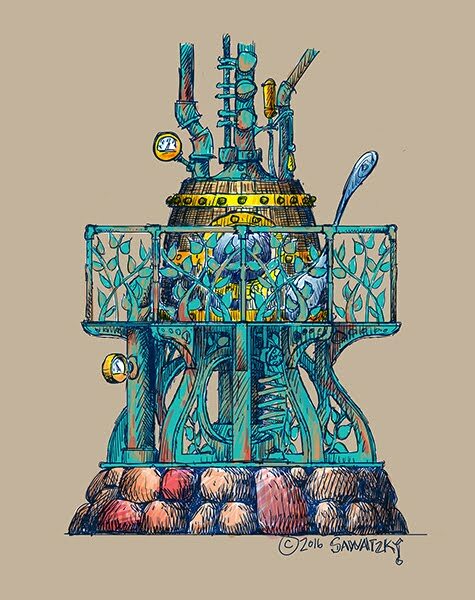 The primary element was the giant still. At that time they were going to dig out a section of the floor to create a lower level and then build a mezzanine level above. The tall still was to have been the centrepiece straddling both levels of the seating area. Those plans have been abandoned. The still survived the changes but now needed to be shorter and located in a different place. 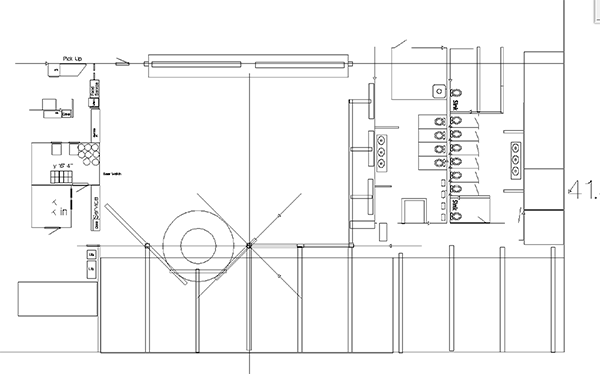 We started with the CAD drawings of the pub area. I imported them into EnRoute and then did the new plans over top. 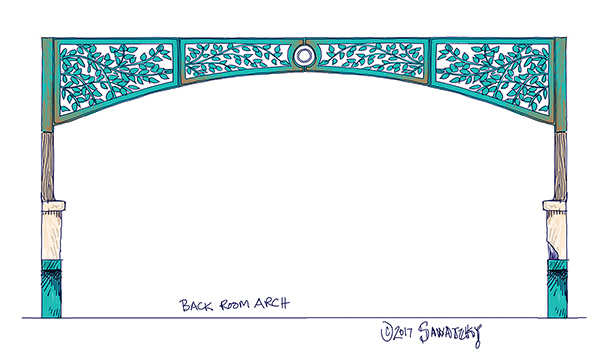 Our new idea was to create decorative beams/arches from the back wall. They would come up to a row of posts which were in the same line as the still. 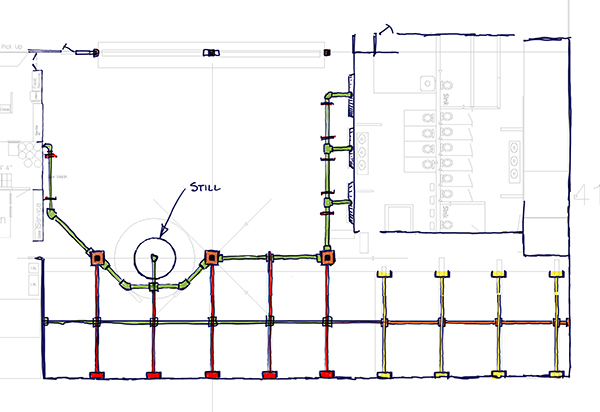 The beams would serve as brackets for heavy industrial piping which would go from the still to the bar area. Once I had the ideas worked out in scale I grabbed a screen capture. This was taken into PhotoShop to do my freehand rendering using different colours for the various elements and sections. 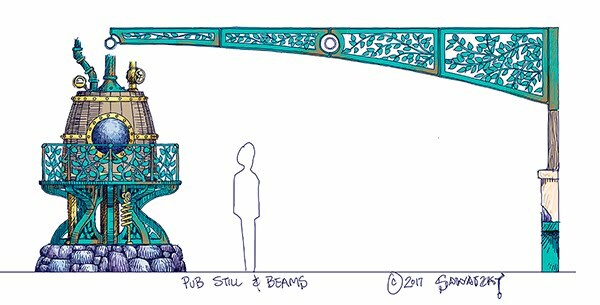 Once I had the ideas sorted out it was back to EnRoute to create a new scale drawing of the still and beam system. A screen capture of the drawing was then used as the basis for the freehand rendering, once again done in PhotoShop using my iPad Pro and pencil. The back expansion area got a slightly different style beam with a post on either end and the pipe down the middle. 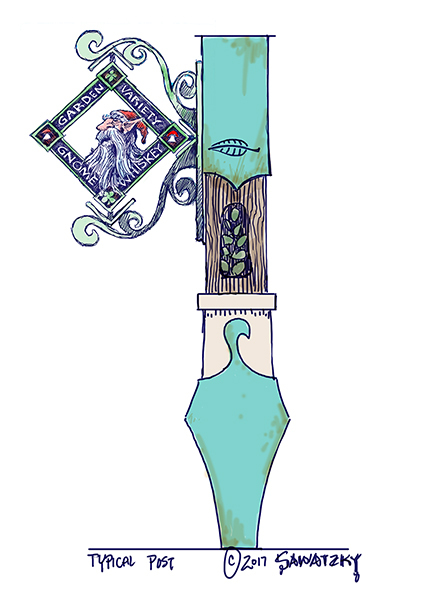 It too was redrawn freehand and coloured on the computer. One more drawing was necessary for the presentation. That was a typical post with one of the pub signs attached. It matches the posts we created for the bowling alleys.